How do I submit a video for assessment? We recommend to tutors that if assignments require a video submission, their students should upload the video to their student YouTube account and submit the URL rather than uploading the video directly to MyBeckett. The reason for this is that YouTube auto converts the video into a file your tutor can view really easily. It saves your tutor time and it means that you don't have to worry about video encoding problems. This guide shows you how to submit your video's URL. 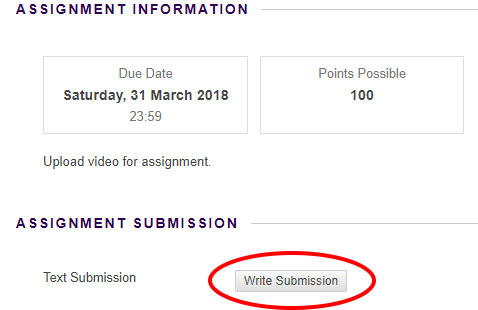 Click on the Blackboard assignment icon to enter the assignment, then click Write Submission. A new box appears. Enter a description of your video. You can also add comments about your video in the Add Comments box. Go back to the Blackboard assignment submission page and highlight the description of your video. Then click the Insert/Edit Link icon. In the Target box, select Open in New Window (_blank). In the Title box, enter a title for your video. Leave the Class box as – Not Set –. You'll be taken back to the Upload Assignment page. Note that in the Assignment Submission section, there is now a hyperlink to your YouTube video. Click the Submit button to submit your assignment. The Review Submission appears, with a green banner at the top informing you that your assignment was submitted. The hyperlink to your YouTube video is also shown (click it to open your YouTube video). The title you gave it appears when you hover your mouse over the hyperlink, and the comment you added earlier appears on the right of the page. If you are having difficulty uploading a large video file for a Blackboard assignment please see our Why does my Blackboard assignment freeze when trying to upload a large file/video? guide.